Our Primary class loves outdoor time, especially when they get to go to the elementary playground area. It seems there is no shortage of climbing and jumping games to be had by all ages. Outdoor Learning is filled with discovery, direct experience and involuntary attention to nature and the sense of self in the natural world. The cognitive benefits transfer to classroom learning by strengthening the child’s determination and willingness to master a skill. Children as young as 3 yrs old, work with numbers as soon as they are ready. 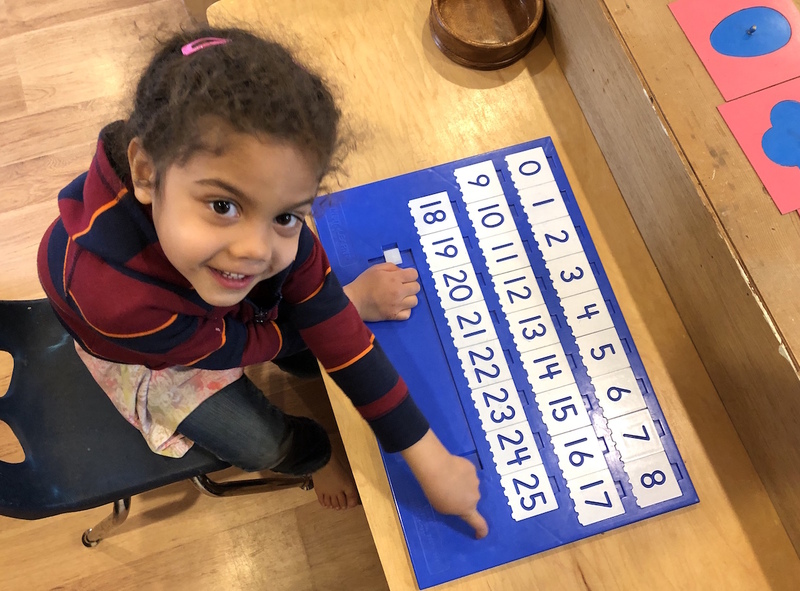 Maria Montessori stressed the benefits of having mixed ages participate together in the same learning environment as it naturally creates a peer mentor culture where children learn from and teach each other. Some of our youngest students (3-years-old) this year have been keenly observant of the older children, in both our own Primary class and the Elementary classes, and have been working their way to being able to successfully climb to the top of the dome structure as they have seen their peers do. Successful adventures on the playground and hikes in the adjoining woods will often bring success in the classroom challenges of learning numbers and letters. When a child has pushed themselves to accomplish new heights in outdoor “gross motor” activities, they often come back in to the classroom, ready to settle to “fine motor” activities of “reading, writing and ‘rithmetic” with just as much enthusiasm and glee and sheer love of learning.